Scent: Peppery, smoky, herbaceous, and slightly-sweet. Benefits, Indications: Liver dysfunctions, hepatitis, cirrhosis, fatty liver, obesity, laryngitis, bronchitis, allergies, influenza, edema, thyroid regulation. Can be used for all types of skin problems, for coughs, hoarseness, stomach discomfort, prostate infection, congested prostate, insomnia, allergies. More Info: Ledum promotes healthy thyroid function and relieves symptoms associated with thyroid imbalance. 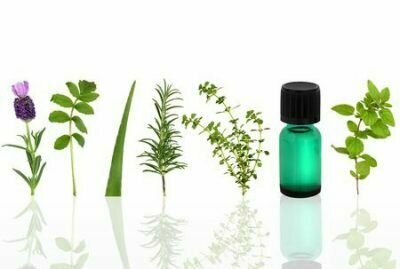 Pure Ledum essential oil can be used to balance either an over active (hyperthyroid) condition or an under functioning or (hypothyroid) condition. Ledum oil has a natural affinity for the immune system and known to effectively stimulate immune function. Its calming properties are useful for relieving stomach upset and nervous dyspepsia and is especially beneficial for relieving cold and flu symptoms such as nausea, aches and pains, congestion, sore throat and cough. It is used in cases of liver toxicity originating from a circulation disorder, mild liver insufficiencies, after-effect from viral hepatitis, enteritis, flatulence. It is also used to treat toxemic nephritis, microbial nephritis, renal calculi, and infectious prostatitis. In addition, ledum is indicated in cases of insomnia, nervousness, solar plexus spasms. Precautions: If using topically, always dilute. Labrador tea--the aromatic beverage and spice: a review of origin, processing and safety. Germacrone defends labrador tea from browsing by snowshoe hares.